As legend has it, Yemen Coffee Beans may have been the origin of Arabica coffee beans. It was written by Arab scholars that this drink was “useful in prolonging their working hours”. In this article we are going to delve into the origins of Yemen Coffee Beans. We will discover some of the history of Yemen Coffee Beans. And, we will see if there are any Yemen Coffee Beans that are worth recommended in this modern times. Do You Want the BEST Yemen Coffee Beans? Or, Maybe A Yemen Java Blend that Might Even be BETTER? Just a quick note that the Yemen Java Blend above are unroasted green beans that are receiving rave reviews for those that know what their doing when roasting their own coffee beans. 2 How Do Yemen Coffee Beans Grow? From the 12th Century and earlier, coffee beans grown in Yemen were grown near the Yemen city of Mocha (also spelled Moka, Moca, or Mocca). Coffee beans from the nearby neighbor of Ethiopia to the east would also grown coffee beans and have them exported from this Yemen port of Mocha. The word Mocha is currently known in many parts of the world as a coffee term that represents the combination of hot chocolate and coffee. This was not always true. In early Yemen coffee history, some varietals of Yemen coffee were rumored to have chocolate notes. So, early on the name Mocha became synonymous with coffee from the port of Mocha, Yeman. And, coffee from the port of Mocha was known to have chocolate notes. At least that’s part of the mythology. The factual part is that there is a city called Mocha in Yemen. And, that city became somewhat famous for exporting great Yemen coffee. To read more about what the term Mocha has morphed into in terms of great tasting chocolate based drinks, read more about this in our article What is Mocha? How Do Yemen Coffee Beans Grow? When I began researching Yemen coffee, one of the first things I did was to go to Google Maps and see what Yemen looks like. And, what kind of mountains Yemen has that can be know as the origin of Arabica coffee. One of the first things that struck me was how barren the land of Yemen seems to be. Even when you zoom in on any of the parts that have some green, you don’t find a lot of green. We suspect these pictures were taken in the winter months. You can see from another picture below that when you get close up to a coffee bean farm, they don’t seem to have a problem with growing things. Even though there doesn’t appear to be extensive green, the soil is reported to be relatively fertile. So, when we found that Yemen coffee beans were a Thing, we were somewhat surprised to find so little land in Yemen that looks like it supports green life. With so little rain when compared to other coffee growing regions, it is amazing that the Yemeni people are able to generate the approximately 25 tons of coffee bean exports a year. One of the reasons that coffee beans don’t flourish more, is that there is a much more popular and more easy to sell crop. That crop is Qat (or khat). Qat is a narcotic plant that the Yemeni chew on as a social supplement. This is similar to what other cultures use alcohol, cigarettes and/or marijuana for. The Qat plant is a stimulant that apparently has side effects of euphoria, or an elevated level of excitement. Another side effect is a loss of appetite. A very common tradition in Yemen is for the men to gather and sit around chewing qat while having long heated political discussions. The popularity of qat means that many crops that might grow coffee are instead growing crops of qat plants. However, coffee is starting to make a come back in some Yemen areas. When we first went looking for Yemen coffee plantations, we looked for traditional places that coffee beans grow. We first went looking for what sort of mountains exist in Yemen. It turns out that Yemen has a major portion of its land that has tall mountains. The tallest of which is Jabal an Nabī Shu‘ayb which tops out at just over 12,000 feet. Considering that Jabal an Nabī Shu‘ayb is not very far from the coastal city of Mocha, the roads to and from the coffee bean plantations can be very steep and treacherous. The city of Mocha lies with the base of the Western Highlands on one side and the coast of the Red Sea on the other side. The two Highland mountain ranges cover most of the western one third of Yemen, and much of the central region in the central and eastern parts of Yemen. The mountains keep the weather from advancing to the northern parts of Yemen. The result is that most of the entire northern border that Yemen shares with Saudi Arabia is desert. These stretches of desert are among the longest stretches of solid sand in the world. These northern stretches of desert are largely uninhabited and can go for years with out rain. The Western Highlands are the home to many of the coffee bean farms. These farms exist in the mountain valleys where the climate is warm and humid. Most of the coffee farms exist between 2,300 feet and 8,000 feet up the mountain side. Many of the farmers are just small families that earn money by supplying larger companies with their coffee beans. Approximately one million Yemeni people participate in the coffee bean growing and exporting business. The Central Highlands produced one of the first Yemeni coffee beans to ever have been exported from Yemen. The Al Hadiya coffee bean is a specimen of coffee bean that is one of the best tasting coffee beans ever. The Al Hadiya specimen is likely responsible for the great reputation of Yemen coffee. However, coffee bean farming in the central highlands is less than coffee bean farming in Western Yemen. The Qat crops have apparently taken over in the Central regions and supply the very popular qat habit that has a very strong grip on the Yemeni population. Yemen coffee is some of the more expensive coffee in the world. If you have had the pleasure of trying a Arab coffee, you might find Yemeni coffee to be similar. With all of the problems that the Yemeni people have growing coffee, finding a good version of Yemen coffee was difficult. Here are the few we found are high enough quality to warrant a higher price. We’ve separate our list into two groups. One that only includes 100% Yemen coffee beans. And, we also found one example of a blend that showed promise and that uses Yemen coffee beans. Our research turned up only three coffee bean products that are 100% pure Yemen coffee beans and also meet our criteria for quality. We found a few others that were also 100% Yemen. But, the feedback on those coffee beans kept us from including them in this list. Just a warning. These 100% Yemen coffee beans only are available at certain times of the year. So, if you click through below, you might see unavailable and would need to check back at a later time. Our first Yemen coffee bean contestant is from a company that includes a group of Harvard University students that are trying to change the world. This group of students is making an effort to try and “stabilize Yemen”. The idea here is that by providing a great coffee product that includes Yemen coffee beans, that they are helping to keep the Yemen economy working well. And, with Yemen having a working economy, the idea is that there will be more stability in the region with happy businessmen. In other words, if you have a higher number of unemployed business men, then those businessmen are looking for other ways to spend their time. 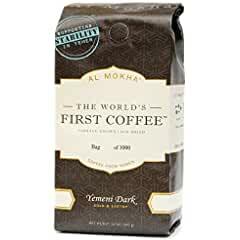 In addition to having a great cause, this Al Mokha coffee also gets positive reviews. 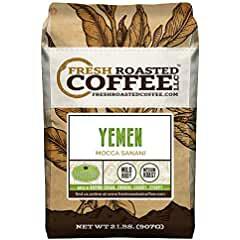 These Yemen coffee beans provide a bold flavor with chocolate notes. This is considered a full body cup of coffee. The roast is called Dark on the packaging. But, it is more towards the medium roast if you are wanting to understand the level of roasting. 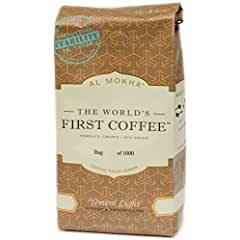 If you aren’t a lover of Dark Roast, this light roast alternative is from the same Al Mokha company. This coffee has citrus notes and comes with a smooth taste that leaves you with a delightful chocolate finish. The beans in this product are a little smaller than you might be used to. But, don’t let the small packaging fool you, these small beans provide a strong punch. The punch is not only in the taste department. These light roast Yemen coffee beans also provide a strong caffeine kick. These beans also come from the Western Highlands region where they are picked and sun dried to perfection. Just like their darker roast brother above, these Yemen coffee beans are 100% Arabica (straight from the Arabian peninsula!). Fresh Roasted Coffee LLC is a name we’ve seen in the past. From what we’ve seen, this name stands for high quality. These Yemen coffee beans directly support the small farmers in the Western Highlands of Yemen. The roast for these coffee beans is a medium roast and has less acidity than you find in most coffees. It also produces a mild body. These Yemen coffee beans are Sanani beans which means they are a blend of beans from lower elevation farmers west of Sana’a (the capital of Yemen). Fresh Roasted Coffee LLC has worked hard to maintain an eco-friendly market name by actively improving their roasting methods to produce 80% less carbon emissions. While you might prefer 100% Yemen coffee beans, during our research we found the one blend we felt we couldn’t pass up. Coffee Bean Direct has put together this coffee blend that give homage to one of the earliest coffee practices. In the early days of Yemen exporting, coffee beans from Mocha (Mokha) was a key export. During those days, the trade routes for ships always traveled from the Indonesian Island of Java to Mokha. True connoisseur’s of coffee would take the coffee beans from the Island of Java and blend them with the Mattari coffee beans from the higher elevations of Yemen. The result was a tradition of coffee blending that lasted for over 400 years. 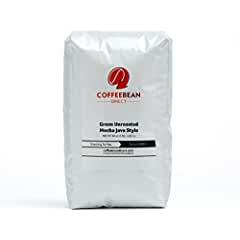 This Coffee Bean Direct classic blend takes the best of these historical coffee beans and continues that tradition of great taste. This blend of coffee has an acidity that is described as bright. One thing to note is that these are a blend of unroasted coffee beans. For some reason many buyers have missed this fact and are trying to grind these unroasted beans. Roasters that cook to a Full City roast describe strong chocolate and tobacco notes. Others roasters describe a second crack roast providing a hazelnut taste, citrus notes, and a marshmallow fragrance when grinding. Those that have roasted with the intent of brewing espresso found that these beans provide ample crema from their espresso machine. Regular coffee brewers found these to provide a rich body that sits well in your mouth. Overall, the feedback for these beans lives up to the reputation that this combination of Java and Yemen coffee beans provided for over 400 years. Yemen coffee beans have been down in popularity, but are making a comeback. The drop may be related to the growing popularity of the Qat narcotic chewing plant that has risen in popularity over recent decades. But, new initiatives are bringing back coffee bean farming as a concerted effort to rebuild the Yemen Coffee Beans name to what it was in the past. Thanks for sharing Al Mokha with your readers. It’s great coffee and if you have any question, let me know! I’m the Founder. Awesome to hear from the Founder of these great Yemen coffee beans.